Learn how to boil an egg, peel a boiled egg and what you can do with boiled eggs, here. Learning how to boil eggs so they peel perfectly is a kitchen skill that will save you a lot of time and effort. But it does not always come easily. As a newbie home cook, I struggled with boiling eggs without leaving it in the pan for too long. When it came to peeling, I had a difficult time doing so without denting them. But after a few more tries, I finally got it down pat! Place eggs in a large saucepan. You can boil up to six eggs at once. Remember not to stack them on top of each other. Pour in some cold water, leaving an inch of water above the eggs. Over medium-high heat, bring the water to a rolling boil. Water usually boils at around 13 to 15 minutes. The amount of time you leave the eggs will depend on their size. For small or medium eggs, leave them in hot water for 14 minutes. As for larger eggs, it takes about 17 minutes to hard boil them. Once the water boils, scoop them out using a strainer and submerge them in cold water. Some believe cracking the eggs slightly before dunking them in cold water helps to peel them easily. First tap it gently on a hard, clean surface to crack its shell. Using your fingers, peel off the shell. You can also use a knife to chop the eggs before removing their shells. For hard-boiled eggs, what I like to do is to tap it onto a clean counter and once it cracks, I roll it forward so the crack spreads. Then, I peel large portions of the shell and rinse it under cold water to make sure no leftover pieces are stuck to the egg. While hard boiling eggs is a no-brainer for the kitchen savvy, soft boiling can be a bit trickier. On average, it takes about three minutes to soft-boil an egg. Letting them stand for five minutes results in firm whites and yolk that’s not runny. Place eggs in a saucepan submerged in water, leaving an inch over them. Cover the saucepan and leave for three to four minutes and drain. Then pour cold water into the saucepan and let the eggs sit until they cool. Once done, soft boiled eggs have firm whites and a runny yolk that can be served on their own or by cutting them in halves. Soft boiled eggs can also make a delicious addition to other Asian dishes, like soba noodles or ramen. What Else Can You Do with Eggs Aside from Boiling Them? Yes, they are pretty tasty on their own, but boiled eggs can enhance the taste, texture, and nutrients of a variety of dishes. You can use them in your salads, deviled eggs, sandwiches, or breakfast bowls. I personally love using boiled eggs in rice porridge and chicken adobo. For those of us who have wanted to elevate our kitchen skills, poaching eggs is a must try. It’s quite intimidating and will take patience, and lots of trial eggs, but once you get the hang of it, it can be just as easy as effortlessly scrambling eggs. Choose fresh eggs. How can you tell? Fresh eggs don’t float when submerged in a glass of water. Instead, they sink to the bottom and lie horizontally. Bring a saucepan of water, about two inches deep, to a simmer. Crack the egg into a bowl and add vinegar (just a drop) into the water. Once the water simmers, swirl it around gently. Pour the egg into the pan, making sure the water is not too hot. Let it sit for about 3 to 4 minutes. Using a slotted spoon, scoop the egg out! Repeat until you have mastered this step. Aside from poaching, you can also coddle eggs. Coddled eggs, much like poached eggs, are eggs cooked just before hot water reaches its boiling point. Though you can by your own egg coddler, baby food jars can work just as well. Start by setting the coddler inside a medium saucepan filled with just enough water to submerge the coddler three-quarters of the way. Over medium heat, bring water to a gentle boil. As you do this, remove the coddler and butter the inside of the jar. Pour two tablespoons of heavy cream, a tablespoon of chopped cooked bacon, chives, salt and pepper to taste. Place the egg inside and coat it with more cream and bacon. Sprinkle more chives, salt, and pepper. Leave the coddler in the water, gently boiling, until the egg is tender and the yolk is runny. How do you like your eggs? 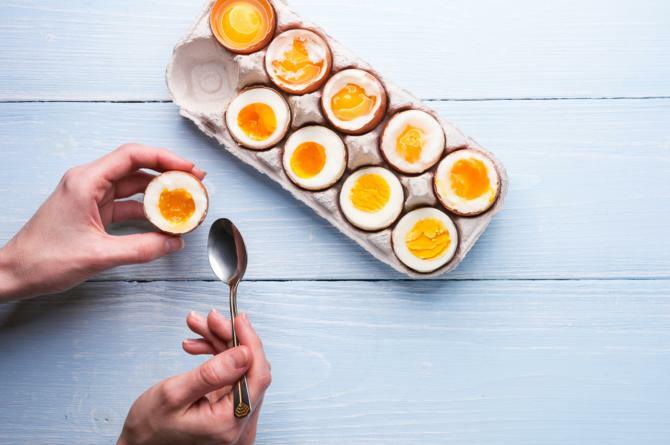 Make it even more appetising by remembering these simple tips for perfectly boiled eggs!